The Disney Magic just went through a dry dock in Freeport in February 2018. Dry dock is typically when Disney Cruise Line does extensive maintenance to its ships. Sometimes the changes are more behind the scenes, such as painting, replacing carpeting, and new mattresses. Other times, the overhaul is more dramatic, such as when the Magic added the Aqua Dunk and refurbished its kids’ clubs a few years ago, or when the Wonder expanded the Cove Café in 2010 so that Alaskan cruisers could view the scenery from the comfort of an enclosed space. The Magic’s most recent refurb included some subtle tweaks, such as the backsplash in the Cove Café, and expanded seating at the Signals Bar, but it also included a major improvement: the addition of Rapunzel’s Royal Table as one of the rotational dining rooms. Tip: If you don’t like the dining rotation you were assigned, you can ask to see if it can be changed. Dining changes can be made on the first day, immediately after boarding. 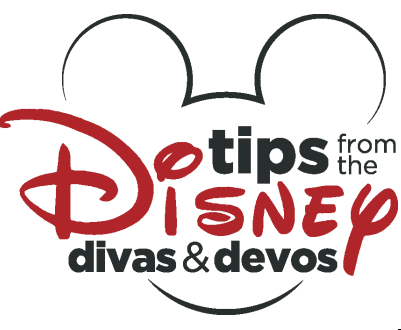 Consult your Navigator or your Disney Cruise app) for the exact location. Interestingly, this same dining room had undergone a transformation just a couple of years ago. It went from the garishly colored Parrot Cay to the only somewhat less muted Carioca’s, featuring Brazilian décor and the Three Caballeros. While Carioca’s was an improvement on Parrot Cay, and the menu was certainly better, I will say that the change didn’t feel particularly dramatic, perhaps because some of the same décor from Parrot Cay remained, simply painted a different color. With the advent of Rapunzel’s Royal Table, everything is completely new, and in my opinion, completely fabulous. The ship already had a connection to the movie via the show Tangled the Musical, which debuted in late 2015. That show is essentially a retelling of the movie Tangled, and also includes a one night takeover of one of the bars on the ship, turning it into the Snuggly Duckling. The new dining room is elegant and well-themed. 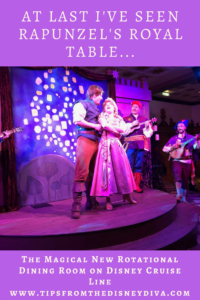 Tip: While Tangled the Musical is currently being shown twice on each seven night sailing, the Ugly Duckling Takeover of O’Gills Pub only happens once, so plan accordingly – we thought this event was fun for the whole family! My family was lucky enough to be assigned to this dining room for three nights during our recent Western Mediterranean cruise on the Magic. We were also lucky enough to have a table right next to the stage. The first night we got to see the newly decorated dining room, which is really beautiful and well-themed. 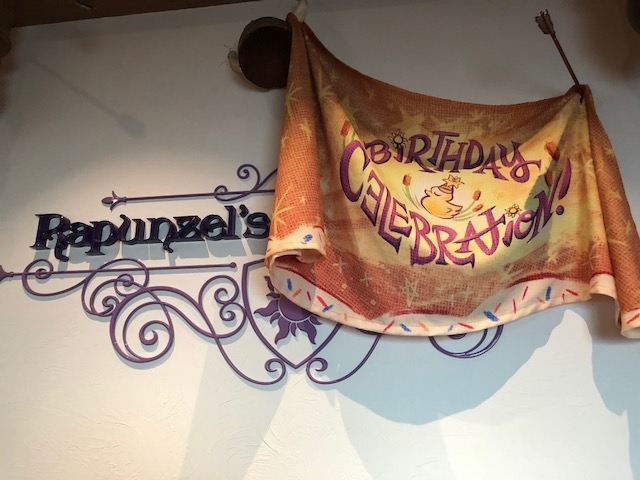 During that night’s dinner, we were told Rapunzel was having a birthday celebration. We met some of the “thugs” from the movie and they were really hilarious! 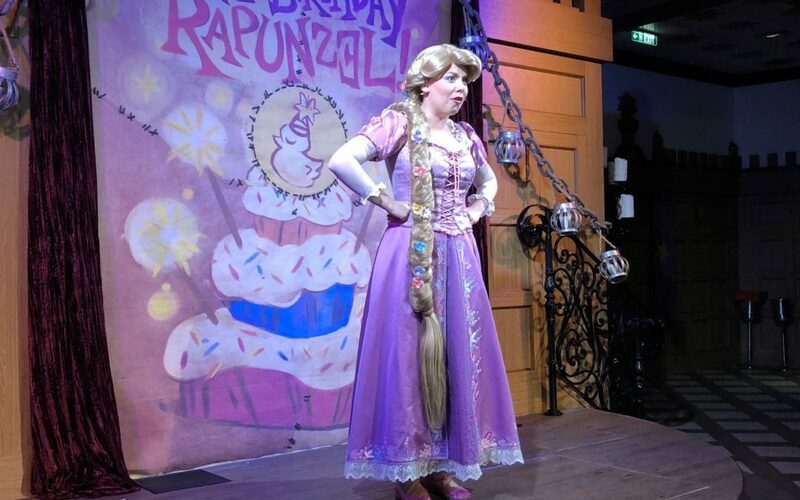 Rapunzel also put in appearance and sang several songs. Tip: We were told that there are two hidden Pascals in the dining room. We only found one. The restaurant’s new look and that first night’s performance had already won me over, but our “show” night, on our last night of the trip, really took my breath away. There was amazing live music and entertainment, and we even got to meet Flynn Ryder, whose smolder was very much in evidence. On both evenings, the characters came around to interact with guests, very much like a character meal in the theme parks. The evening was capped by a really beautiful ceremony involving lanterns. 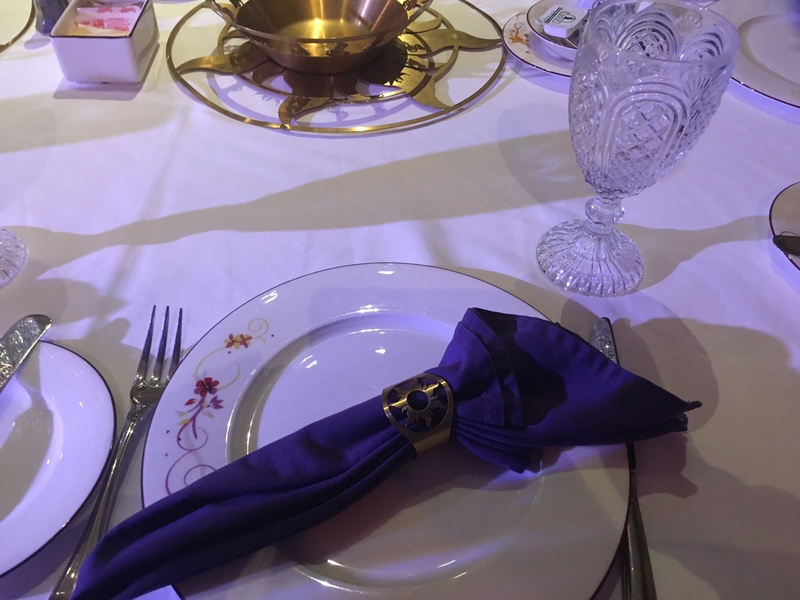 The place settings for Rapunzel’s Royal Table include special bread baskets, glasses, china, and napkin rings. The menu is also wonderful, which was especially notable on this cruise as it seems that Animator’s Palette’s show menu has really gone downhill. We really liked the pretzels with mustard dip that were part of the bread service, and the pan-seared sea bass filet was amazing. Others in the party enjoyed the Tangled Pasta, which is angel hair pasta tossed in basil-pesto with caramelized sea scallops, and the Spinach, Zucchini, Eggplant and Ricotta-filled Potato Crepes. Tip: Unlike Table Service restaurants at the parks, you can order extra food at no extra charge. Got a sweet tooth or can’t choose between desserts? Order both (or even three)! Don’t like the entrée you picked? Ask your server for a different one. I had been looking forward to Rapunzel’s Fry Pan Sweet Bread, which is fried dough dusted with powdered sugar, topped with a chocolate hazelnut sauce and served with vanilla bean ice cream. 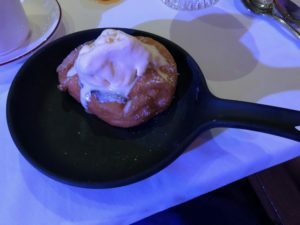 It’s served in a cute little fry pan, similar to that used at the Bon Voyage Breakfast, but the dough was cold, so it was really the one miss of the meal for me. My daughter said the Gothel Blackforest Tower was much better – so much so she didn’t save a bite for me. 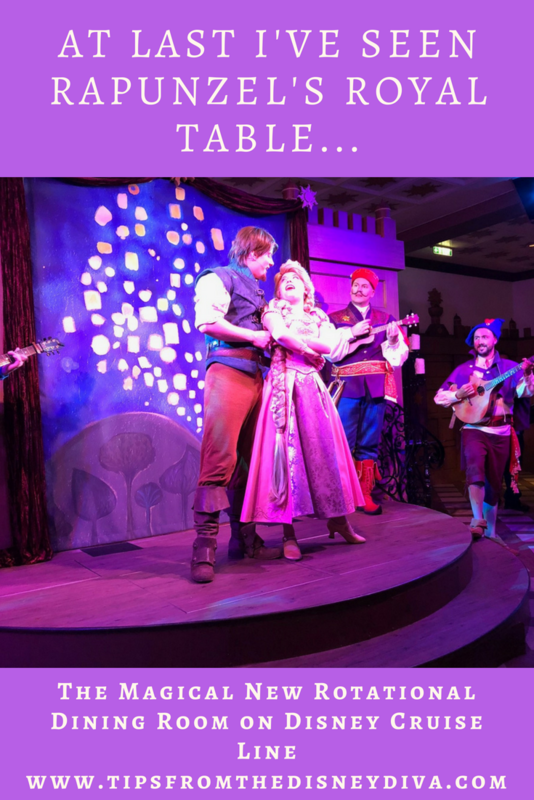 Rapunzel’s Royal Table is a stellar add to the rotational dining room line up. Even without the shows going on, I like the look of this place so much that I would consider asking for a dining rotation that brought me here three times. I certainly would not book Palo on either show night at this restaurant. 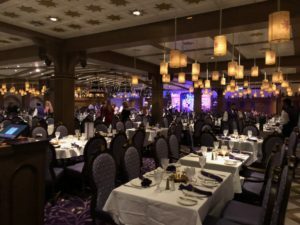 I have heard comparisons drawn between this restaurant and Tiana’s Place on the Wonder, and if that’s the case, then I really need to book another cruise on the Wonder immediately! Happily, we have another cruise booked on the Magic this fall, so I will get to experience Rapunzel’s Royal Table again. If you need help planning your Disney Cruise or Disney theme park vacation, contact Patricia at All 4 Dreams Travel today for a FREE quote!